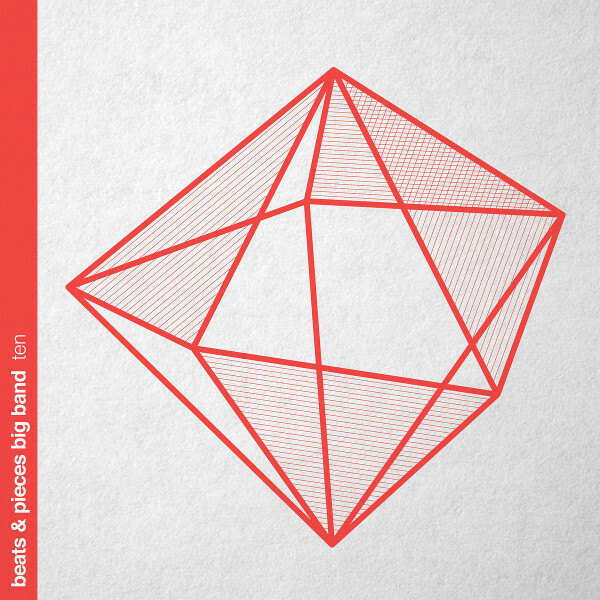 The Ten of the album title refers to the number of years since the founding of Beats & Pieces Big Band by Ben Cotrell. In that time, they’ve only released two albums, but they’ve established themselves as one of the most innovative groups with this configuration out there. To commemorate the tenth anniversary of their first performance, they convened in the same location and recorded this live performance. Five of the ten tracks are taken from their two previous albums, with the other five being new to this release. Cotrell acts as director and chief composer-arranger, but does not play on the album himself. Cotrell’s arrangements are brought to life by a more-or-less standard Big Band lineup, with three trumpets (Owen Bryce, Graham South, Nick Walters), three trombones (Richard Foote, Simon Lodge, Rich McVeigh), and three saxes (Anthony Brown, Oliver Dover, Tom Ward), along with a rhythm section consisting of Anton Hunter (guitar), Richard Jones (keyboards), Stewart Wilson (bass), and Finlay Panter (drums). But the music they play is far from standard Big Band fare, resembling the innovative sounds of groups like Jaga Jazzist, Worldservice Project, and Snarky Puppy more than anything from the swing era. They’re not afraid of electronics, odd meters, or other modern touches, and there’s a great variety in moods and colors. There are some densely orchestrated passages of complex interacting parts, there are periods of floating ambient tones, there are great riffs with slinky grooves, there are wild blowouts, nods to electronic dance music, and much more, all delivered in a way that flows well without being predictable. This group is a true successor to the great United Jazz + Rock Ensemble and larger incarnations of Ian Carr’s Nucleus, and a peer of the contemporary groups mentioned earlier. Check them out for a taste of how the Big Band, a type of ensemble that’s been around nearly a century, can be fresh and exciting in today’s world.